This happened while I was browsing for images to add to a gaming.se post; one of the sites I visited (to get an image of a transfer cable) must have had drive-by browser exploit code running. UAC alerted me that a weird temporary executable wanted to run, and I declined, but I still got the fake antivirus executable running on my machine. Sigh..
For now, I have uninstalled Java, which works. But I wondered if I could disable the Java plugin in Google Chrome instead. For Java specifically, Chrome now disables Java by default on all pages and prompts you to allow it to run each time a site needs it. For more general plugin worries, Chrome allows you to block all plugins on all sites completely, and then allows you to selectively enable them on a page without reloading it. You can also configure exceptions for particular URLs. To enable this, under the Plug-ins section of the settings url: chrome://settings/content select "Block All". I found a really old bug / feature request on Google Chrome here. It appears in Chrome 6.0 or later. 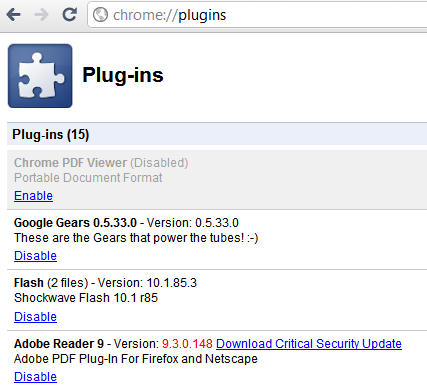 Visit chrome://plugins/ or about:plugins and disable Java there. But my general recommendation is to uninstall Java -- you really don't want Java on your system unless you absolutely, positively have to have it .. because there are so many new exploits for it. I would also recommend disabling any plugins you don't absolutely need. Every enabled plugin is an attack surface, and yet another thing that needs to be kept up to date..
One small trick I use with Java is to hunt around and install the x64 version only, which I only use when I fire up IE x64 to use the one-off Java only apps like the one you reference. No working Java was detected on your system. 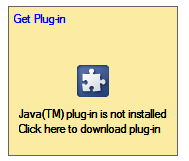 Install Java by clicking the button below. One can read about other switches in The Power User’s Guide to Google Chrome. There is other useful information, too. This should protect you from more than just Java vulnerabilities. To measure the effectiveness of these approaches (EMET alone seems to stop 90% of them) you may want to use the Social Engineering Toolkit. Instead of disabling the plugin in Chrome, another possibility is configuring Java in order to disable it for all browsers. Uncheck "Enable Java content in the browser"
Not the answer you're looking for? Browse other questions tagged google-chrome java plugins vulnerabilities or ask your own question. How can I get a virus by just visiting a website? How can I disable Java in my browser? How do I get Free Download Manager monitoring to work in Chrome? How does Google Chrome know my Firefox history if I never imported it? What does the removal of NPAPI plugin support mean to an end user?